BESTEK Backseat Headrest Mount Holder for car provides an ingenious mounting solution for your handheld devices. With fully adjustable ball joint and arms that allow a 360-degree rotation, this holder gives you the flexibility and durability to optimally use and view your device during car trips. You can enjoy your favorite music and films while sitting or lying down on your backseat. It’s also a great choice for calming your children during long trips by playing music, games or cartoons. The headrest mount holder is designed for most 7-10 inches tablets, fit iPad air /iPad air 2/ iPad 1 /iPad 2 /iPad 3 /iPad 4 /iPad mini 1 / iPad mini 2 / iPad mini 3/ iPad mini 4/iPad Pro (9.7 inch), Samsung Galaxy Tab etc. A nob in the back that allows for easily adjusting and tightening. 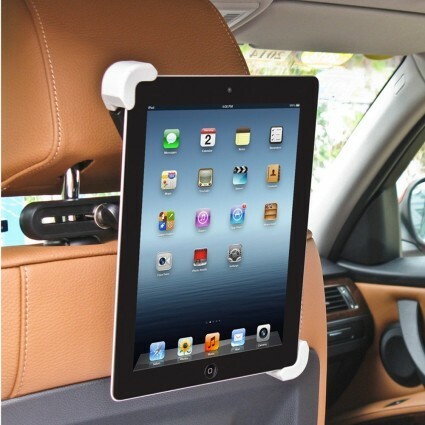 It can hold your iPad tightly against the headrest and protect it from excessive shaking and vibration due to bumpy roads. A joint bolt of 360 degree rotation, you can swivel it freely, watching movies and playing games in a comfortable angle. The headrest mount holder can be easily attached to the back and front headrest posts in seconds, to effectively entertain your family members during short or long car trips, especially a good travel companion for families with small children. • Before purchasing, please confirm whether your car headrest is round shape. • Our holder is mainly designed for regular round post of headrest, and it don't fit squared one such as Volvo XC 60. Q: Will it work with a thick case? I have a new Trent case that has the front and back covered- similar to a otter box. A: My daughter used a mini iPad with the case and worked well. Q: Will it hold a kindle? A: Yes. I have an older version kindle and it fits great. Q: If mounted on the passenger seat so child in the back can see it,, does it in any way interfere or bother someone sitting in the passenger seat? A: No, it will not interfere sitting in the passenger seat after mounted this holder. Q: Does it have the ability to face the iPad more in a down wards direction? A: Yes, you can tilt it any direction.